For a 16” pillow cover, I start with an 18” square. This gives you some wiggle room with pattern placement, especially if you’re like me and end up cutting the square wonky and don’t quite manage to get the stencil in the middle of the square. It is best to go bigger, then trim afterward. Cut two pieces of freezer paper 18” square (pretty convenient that freezer paper is 18” wide), then cut two pieces of jersey 18” x 18”. Using one piece of freezer paper, fold it in half, then quarters, then diagonally if you choose – cut out shapes as you would if you were making a paper snowflake. I’m always amazed at how my designs turn out. Make sure that you don’t get too close to the edge because you will be trimming down your pillow – I like to leave 1.5 – 2”. With your design unfolded, place it plastic side down on the front of the jersey square that you plan to use as the outer layer. Line up all the edges, then gently iron in place. Because we’ll be using watered down craft paint, I like to fuse a second piece of freezer paper to the back side of the fabric, so that the fabric is sandwiched between the two. This will give you nice, crisp edges and protect your surface from bleeding paint. Thin your craft paint by about half with water. It should be fairly runny. Using a sponge (I like to use a makeup sponge), dab the paint onto the open areas of your design. Once your design is fully covered, you can remove both pieces of freezer paper. Let the paint dry before moving on. 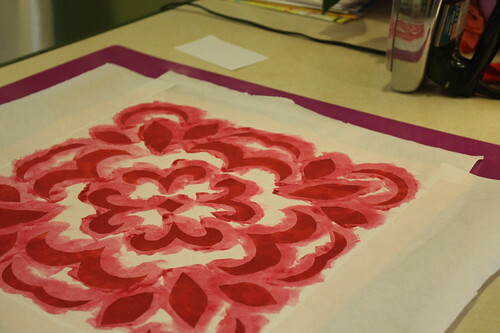 ***i learned a lesson on executing this tutorial - for dark colored fabric, it may not be necessary to thin your paint. The only thing I was able to get to show up on black fabric was light/bright colors at full strength. This is definitely something to think about when choosing your fabrics and colors! I was going for a deep red, but that wasn't showing up at all!! 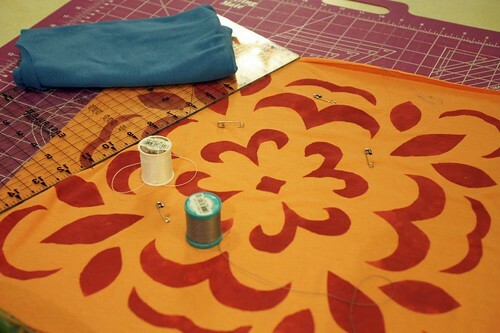 Lay your stenciled jersey square on top of the second jersey square. 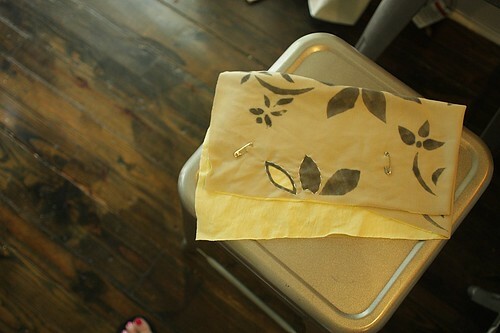 Use safety pins to keep the two pieces together. Now comes the slow stitching part. 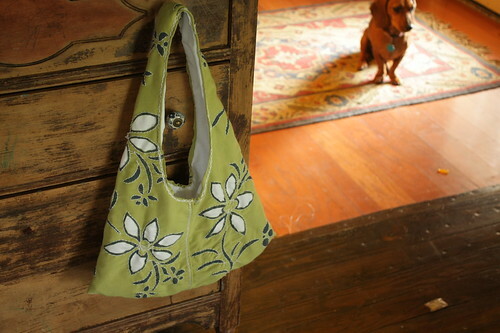 Stitch and stitch around all your stenciled parts, add appliqué, beads, whatever you’d like. 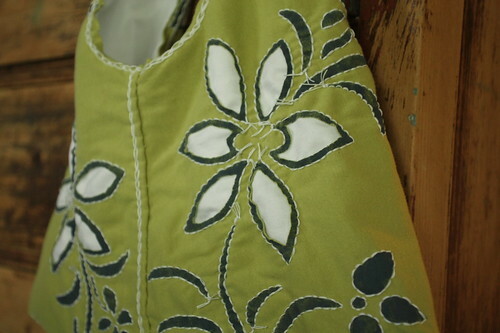 For reverse appliqué, once a shape has been sewn, gently pick up the top layer making sure not to grab the bottom layer, then cut out the top. 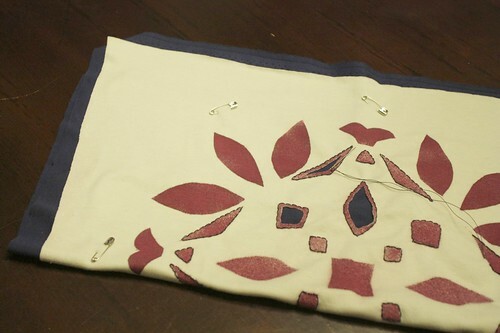 Once your pillow front has been sewn and appliquéd it is time to add the envelope back. Using the remainder of your half yard of the two jersey pieces, cut two rectangles of each piece 13” x 18”. You want the two rectangles to overlap a few inches in the middle. Get everything all lined up, then trim your pillow down to about 17” square. 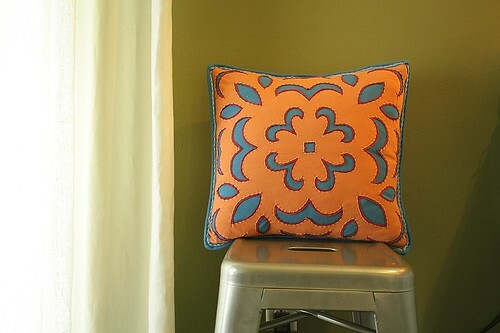 I'll now use my finished pillow for the remainder of the tutorial. On the two opening edges of the envelope back, fold the fabric over and sew in place or bind with an additional piece of jersey (you can fold over once or twice). With all the pillow pieces lined up, sew them all together about 1/4" from the edge. Lastly, bind the edge of the pillow with the 1” piece strip of jersey by simply folding the strip in half lengthwise over the edge. 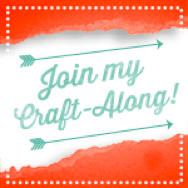 You can use a decorative stitch, like this chain stitch, if you’d like. That's it! 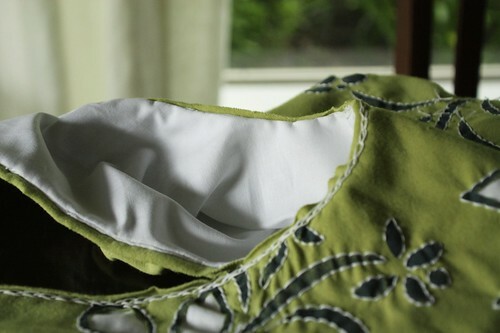 Use a 16" pillow form to fill your pillow cover. **I think I'm ditching the black stencil cover I started here and trying again with the reverse - black as the under layer with the green stenciled in deep red. The thick layer of paint on the black is just plain gross. 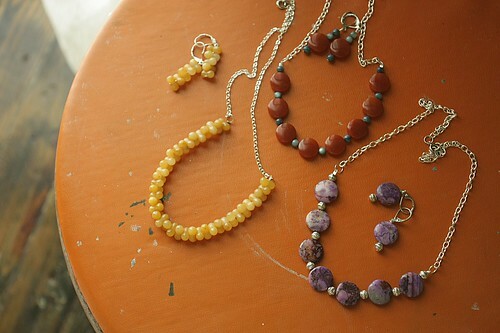 I love my original color combo, so I don't want to give it up! Live and learn!! ***there are fabric paints/markers on the market that would probably work very well for this project, BUT I did not have any readily available to me (i've been less than thrilled with the colors of fabric paint offered at my local craft stores). I used what I had on hand, which happens to be acrylic craft paint. In the past I have had good luck using sharpies to outline my stencils, but that's not a great option on black. If you're going to do some hand sewing, you need needles and thread. Have you ever gone to the fabric store and seen the selection? It can be overwhelming. I am no expert by any means, but when I've worked on hand sewing knits, the needles I use are sharps (I believe Natalie Chanin talks about this in the Alabama Stitch book). On my first skirt, I did experiment with other needles, such as craft needles and embroidery needles, because that's what I had, but the sharps did indeed work the best. If you are working with a woven or some type of project there are other needles best suited for the job. 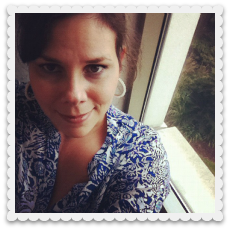 A good article on the subject is at CraftStylish, Know Your (Hand-Sewing) Needles. I quickly searched for an article on thread with no luck (i'm sure there are some out there, but i didn't have the time to do too much searching!). 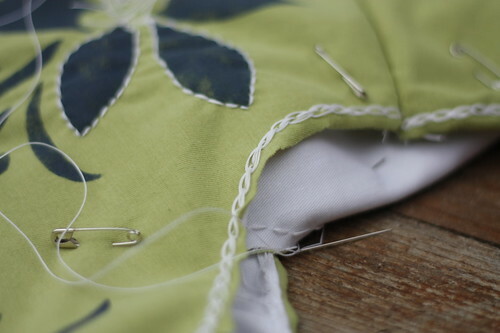 Personally, I like to use all purpose thread for basic applique and buttonhole thread for seams. I've tried using the buttonhole thread for applique, but I found it to be too stiff, though it does work well for outlining the lines of reverse applique. 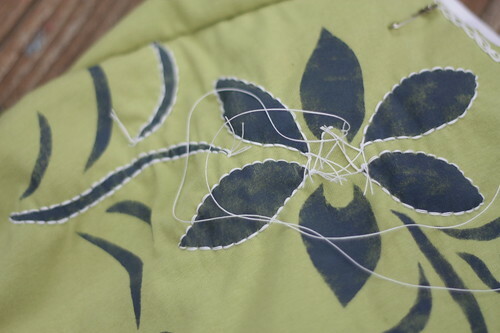 I use embroidery thread (or floss) for decorative stitches. 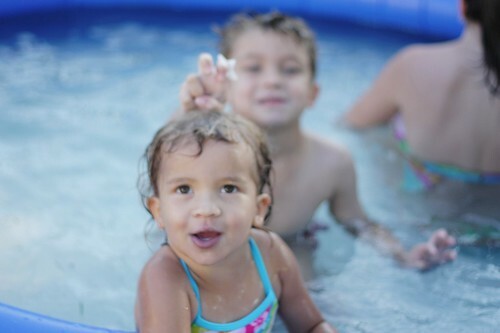 My best advice is to experiment with what you have on hand to see what works best for you. 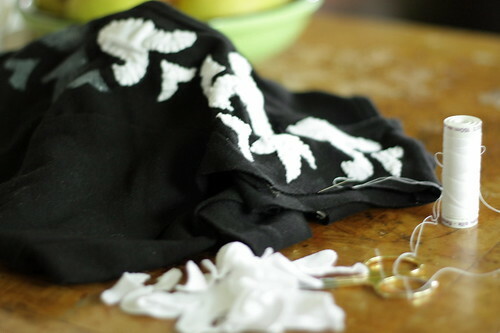 In my experience with reverse applique and regular applique, a sharp pair of embroidery scissors are a must. They work great on snipping those tight little corners and crevices and usually make a clean cut on your thread. I know there is a ton more information to share, if you have some helpful links please list them in the comments below. I've turned on threaded comments so that we can have a conversation in the comments.